Ellie's Haven's charity shop has been a big success. For legal reasons the shop is run as a not-for-profit company called Ellie's Haven Trading Co. Ltd. All of its proceeds are donated to the charity. 1. Help in the charity shop. 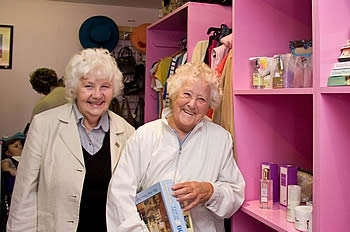 How about joining our great team of volunteers who handle sales, sort donations and keep the shop looking nice? Typically, we have two volunteers in the shop at any one time, and they a morning or afternoon "shift" a week. 2. Donate high quality goods. Please think of Ellie’s Haven when you’re turning out your wardrobes and cupboards. You can bring items into the shop or get in touch and we’ll collect stuff. There’s some fantastic bargains (and some great gossip) in the Ellie’s Haven charity shop. Come and see (and hear) for yourself. We’re open from 10am to 5pm every weekday.